This post was supposed to go up February 14th but yet again, I was foiled by technology. The following was written while in line for a total of 4 hours. It’s a sad day when an incredible yarn company goes out of business. The only bright side is the sale. At 9am February 14th they opened the doors to their workshop in order to clear out the last of their stock, supplies, and equipment. Fortunately this closing was by choice, not hard circumstances, and the owners are moving on to new projects and less responsibility. That means no guilt for those of us benefiting from their closeout! I came with a budget and am blowing that out of the water but it is well beyond worth it! I have pounds and pounds of silk, viscose, modal, bamboo and alpaca undyed yarn cones coming home with me along with a couple amazing super-skeins of luxury yarn that I would normally never be able to afford. Of course I’m not the only one who came to Vallejo, CA to score. I am 2/3 through the line and have already been waiting nearly two hours. We’ve camped out in yarnville and kind coconspiritors have taken to passing around cookies and holding places during bathroom breaks and last minute additions. 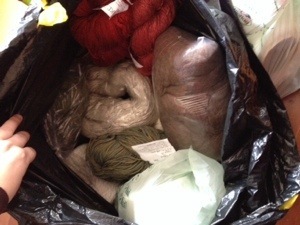 Suffice to say I’m excited and will of course be starting up my active knitting life again. One project has already been completed. 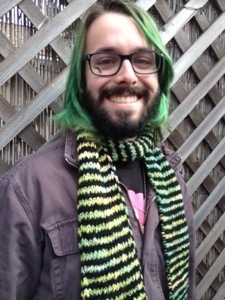 This scarf for my partner Michael is made entirely from my handdyed and handspun yarns. I’m proud of it despite it being messy because it’s the first project I have finished in a couple years. I’m expecting many more to come. I am Pagan. Though I was raised a highly spiritual agnostic, I found that I always associated nature with some sort of ineffable power. Thus, I found Paganism. I call myself a crafter, and realized recently that there isn’t a big difference in the way I practice the Pagan Craft and the way I craft my yarns. Each movement is intentional both in a ritual and in spinning. From the seeming chaos in my fiber basket, I spin my wheel clockwise, bringing together a thread that shows every color which in turn show the twist of the yarn. And with intentional movement I have created something beautiful. Then, when I am done, I share the joy it has already brought me by selling or trading it to someone for something that will bring me joy and fulfillment in return. Spinning also has an explicit place among Pagan myths as a metaphor for the course of life. Among ancient Greeks, the three Moirae were the most powerful beings even among the gods; Klotho spun the thread onto her spindle and Lakhesis drafted the thread out into measures, one for each lifetime, then Atropos chose the manner in which each life ended, cutting the thread in just the right place. Neither man nor beast nor god could escape the length of thread that the Moirae spun for them. Though their task may seem a cold and morbid one, they were reassuring figures to the people of ancient Greece, proving that the gods themselves were not all-powerful. In Norse mythology the goddess Frigg, often interchangeably associated with Freyja, in addition to being the patron of love, fertility and beauty was the spinner of fate and patron of death. She is said to have had the gift of prophesy but did not tell what she knew in order to keep people from meddling. The constellation most commonly known today as Orion’s Belt was then referred to as Friggerock — Freyja’s Distaff or Freyja’s Spinning-wheel. She sat in the sky and watched over all things while spinning fate from the clouds on her jeweled spinning wheel. Though I don’t tend to muse upon death as I spin my yarn, I do often think of the changes it undergoes. I wonder what the yarn will look like when it is complete and I wonder what my customers will create from it. Though I have finished my part in the process, the end of my personal project, the yarn moves on to change state and become a scarf or a hat or a pair of socks in the hands of another crafter. Though they may not know or acknowledge it, the yarn they buy from me is created with deep thought and mindful intention beyond just making yarn. As it is created it brings joy into my life and that joy is spun into the threads as surely as the fiber itself. When you buy hand crafted goods try to remember that though you are paying more, you are getting a product whose creation brought happiness into someone’s life before it even came to you. That piece of art, that gem of craftsmanship, is something powerful and worth appreciating. 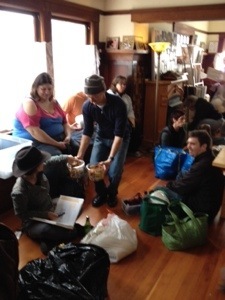 The Craft Sale at Knit-One-One in Berkeley this past weekend was a success. We had a great spot outside the studio across from Bag It Designs who we met at the Louden Nelson Winter Fair in Santa Cruz last year. I debuted my single-ply worsted weight hand spuns and they were well recieved. I sold a couple hanks to the lovely owner of Bubbles and Boo who plans to use them in her product photos before knitting something beautiful for herself. I’m pleased they turned out so well, and I think I’ll be doing many more of them in the future. During the sale, I set up my spinning wheel and answered questions from dozens of curious folks about the mechanics of the spinning wheel. Many were most surprised to find out that my wheel was not antique at all, and that the company that produced mine is still doing so. Though spinning yarn is a craft associated with times of yore(Remember sleeping beauty? ), the skill has been passed through families and friends and has grown so much in popularity that many yarn shops now also sell spinning fiber and some even host classes. Though sales were not as high as we’d hoped, we did meet a lot of lovely local crafters and I discussed the possibility of teaching such a drop-spindle workshop at Knit-One-One in the future. While a spinning wheel is a major investment, costing anywhere between $300 and $700, drop spindles sell for closer to $15 and are a great way to start learning without having to make a huge dent in your savings. In fact, that’s exactly where I started in 2007, and since I was given a wheel by my aunt, I spend much of my free time at home consumed by this hobby. I’m still dreaming about someday making it a full time job. For now, occasional fairs will do just fine.